BEAUREGARD, Ala. — Leaders in this rural Alabama area began working on a community storm shelter months ago, selecting a potential site and meeting to consider how many people might need protection. Plans were still coming along when a giant tornado descended, leaving nearly two dozen bodies inside splintered homes and scattered across Beauregard’s fields and country roads. Now that the worst has happened, Fire Chief Mike Holden said, perhaps everyone will agree on a final plan and find the funding to remedy a situation that much of Alabama addressed about eight years ago after twisters killed more than 250 people statewide in one day. “I’m hoping this will open up some FEMA money for it,” Holden said Thursday while helping guide recovery efforts. Part of the trick, officials said, is finding the proper mix of public and private shelters to help an unincorporated area inhabited by roughly 11,000 people. Many residents aren’t clustered in orderly subdivisions but spread out along county highways and dirt roads. The massive EF4 twister that demolished parts of Beauregard was the worst of 30 tornadoes that raked the Southeast on Sunday, snapping pine trees and pushing entire homes into gullies. Damage is particularly bad along two roads where friends and extended families lived in mobile homes and small houses. As the sky darkened and storm warnings flashed, dozens of people fled to the safety of the area’s one community shelter, Providence Baptist Church. Cindy Sanford was cleaning out a closet when she felt the need to leave with her grandson; she returned to find her mobile home demolished, but they were safe. Others didn’t have time to leave home, didn’t feel the need or didn’t know where to go. Bobby Kidd lost his 6-year-old grandson, AJ Hernandez, when the twister exploded their home, hurling the family through the air. Kidd doesn’t know whether having additional shelters would have saved his grandson or anyone else, but he wishes more were available. “I’m not going to say that if there were more locations for people to go to that lives wouldn’t have been lost, but we only have one location. We really do need more. More that are closer,” he said. 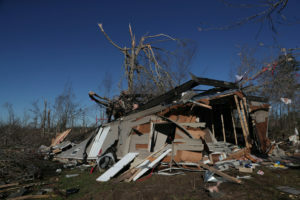 Federal grant money helped fund the construction of hundreds of shelters after the deadly tornado outbreak of April 27, 2011 — nearly all in north Alabama, where most of the deaths occurred. Lee County, home to Beauregard in east Alabama, wasn’t hit by a tornado that day and didn’t share in much of the federal money that helped pay for in-home and community shelters elsewhere. But a study published by the American Journal of Public Health after an analysis of the 2011 outbreak showed the need for community shelters, and leaders of the Beauregard Volunteer Fire Department want one. Holden said the department has discussed plans to add one and possibly two 40-person shelters at a new fire station that will be near a planned athletic complex. Tornado and sports seasons overlap, he said, and having shelters so near athletic fields would provide cover for people in severe weather. “This has been an ongoing plan for more than a year,” he said. Efforts to obtain grants and other funding have slowed progress, Holden said. Others aren’t so sure about the value of shelters that aren’t at people’s homes. Kathy Carson, director of the Lee County Emergency Management Agency, said a basic mass shelter that holds 90 people can cost $140,000, and the return may not be worth the investment. “People are not going to sit in that thing for six hours during a (tornado) watch, and by the time a warning is out, it’s too late,” she said. Community shelters constructed after the 2011 outbreak were publicly credited with saving lives during a 2016 tornado in the northwest Alabama town of Aliceville, but Carson said there was no guarantee anything would have helped in Beauregard. “This is the worst of the worst that struck here, and (residents) had no protection unless they were underground,” she said. About an hour before the storm hit, Lee County emergency managers posted on social media that the tornado-producing storm would track over the county and urged people, particularly in mobile homes, to evacuate to a “safer location.” They noted that Providence Baptist and locations at Auburn University, about 9 miles (15 kilometers) away, were available as shelters. Rita Smith, a spokesman for the county emergency management office, said 19 individual shelters were constructed in the county from grants after the 2011 outbreak, but the cost is too high for many people, even with federal assistance. “It is heartbreaking for us. We would love to be able to have a shelter in every community, everywhere we could put one. It is just not financially feasible,” Smith said. The agency has applied for funds for a community shelter in the county, Smith said, but she declined to provide details such as the possible location. Sen. Doug Jones, who toured some of the damage, said the devastation may hold lessons for the future. “You use tragedies like this to try to look forward and see what you could have done better, and I think we’ll do that here,” the Alabama Democrat said. AP writers Kim Chandler in Montgomery, Jeff Martin in Atlanta and video journalist Joshua Replogle in Beauregard contributed to this report. Left: A house was devastated by two deadly back-to-back tornadoes in Beauregard, Alabama. Photo by Shannon Stapleton/Reuters.